To bump a single period within the same week, simply drag it forward using the green crosshairs. You will be given the option to also bump future plans for that period or simply overwrite the current one. For more information, see our video, Bumping Single Period. 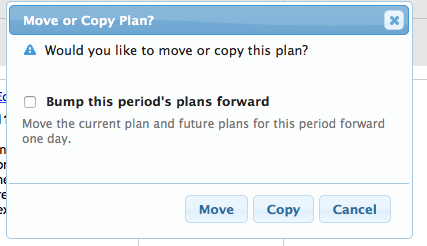 If you drag the plan back a single day you will also have the option of bumping the plans backwards. This will take the plans for the day you dragged, as well as all future plans, and move them back a day. 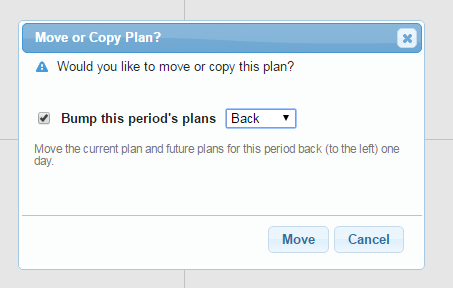 This option only appears when dragging a plan back a single day. The plan you are dragging to will be replaced with the plan that you dragged. For more information, see our video, Bumping Single Period Back.